Dr. Tony Buffington is an emeritus professor at The Ohio State University College of Veterinary Medicine, and clinical professor (volunteer) at the UC Davis School of Veterinary Medicine. He received BS, MS and PhD degrees in nutrition and the DVM degree from UC Davis. His clinical interests include environmental effects on disease, obesity, evidence-based medicine, and effective medical communications. His research has documented the effects of environmental stressors on disease in cats, and the effectiveness of environmental enrichment in mitigating them to promote recovery. Dr. Buffington has published 130 scientific papers, 30 book chapters, and 3 books. PRACTICING CAT FRIENDLY The articles presented by the American Association of Feline Practitioners (AAFP) focus on feline-specific information on cats’ unique behaviors; diagnosis and evaluation of disease and conditions; better approaches and techniques for cats; and strategies to decrease stress associated with the veterinary visit for cats, caregivers, and your team. In the early 1990s, the National Institutes of Health’s National Institute of Diabetes and Digestive and Kidney Diseases released a request for proposals for animal models of a chronic pelvic pain syndrome in humans, called interstitial cystitis. My colleagues at Ohio State University and I applied, were funded, and received around 200 donated cats to study. These cats were no longer acceptable as pets because of intractable LUT signs and, alternatively, would have been euthanized by their primary care veterinarian. Nearly all of these cats also respond to Multimodal Environmental MOdification (MEMO) with resolution of both the index and comorbid signs. Use of the term “Pandora syndrome“ avoids applying any particular organ name to the disorder in the absence of evidence that the disease arose in the LUT (and presence of evidence that it did not), as opposed to the LUT being affected by pathology in another system. FIGURE 1. 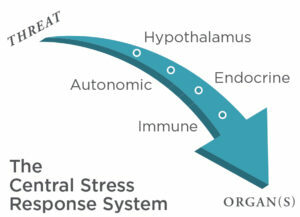 The central stress response system. Pandora syndrome is an “anxiopathy”: that is, a pathologic condition resulting from chronic activation of the central stress response system (CSRS) (FIGURE 1). Persistent activation of this system by a chronic perception of threat that exceeds the animal’s perception of control mobilizes activity in variable combinations of the autonomic nervous, endocrine, and immune systems. The result can be pathology affecting any organ system or combination of organ systems (TABLE 1). The variability in response to chronic perception of threat may result from organ-specific differences in familial (genetic, epigenetic, environmental) vulnerability and from exposure to threatening events such that the CSRS is durably sensitized to the environment. Such events often occur early in life, even before birth when the CSRS is most plastic and vulnerable to the events communicated to it by the mother through the placenta.13 However, the CSRS can be sensitized by sufficiently harsh events at any time of life. 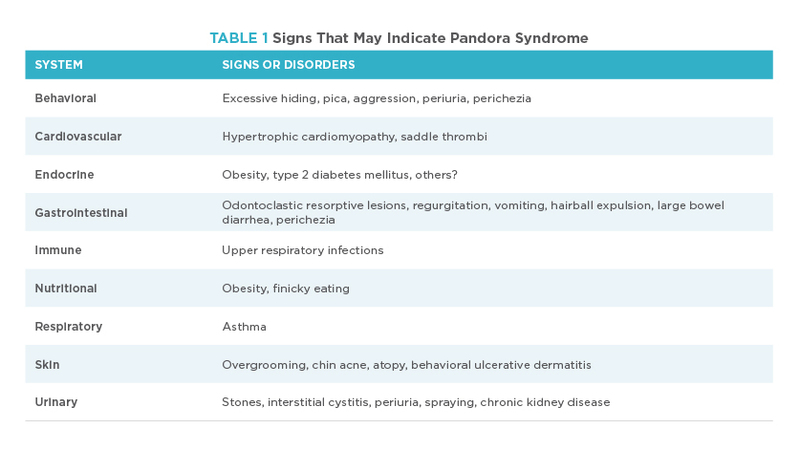 Many organ systems are represented in expression of Pandora syndrome (TABLE 1), and the list is undoubtedly not comprehensive. 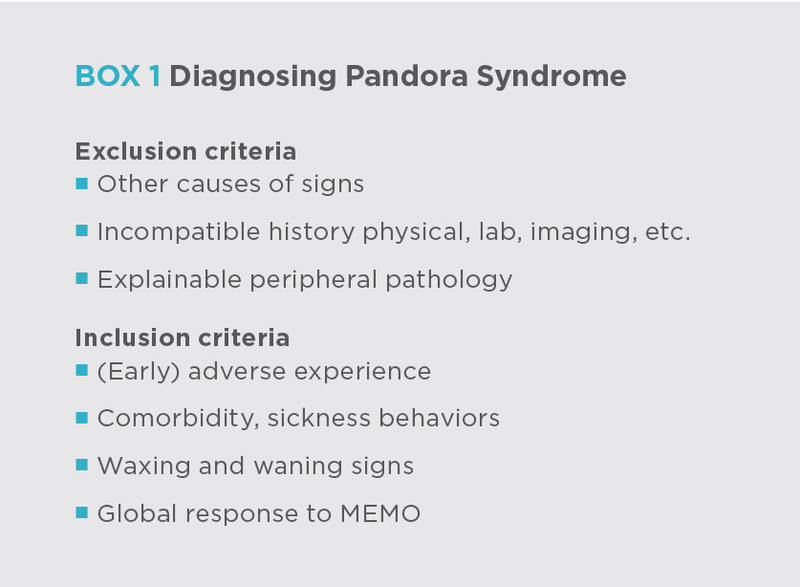 Moreover, Pandora syndrome is only one possible cause of the disorders listed and may or may not be eventually added to the differential diagnostic criteria for that disorder. Life history: Events in the cat’s life history include early adverse experiences, such as being found as a stray or orphaned (especially if bottle fed) and exposure to serious trauma or environmental instability. Home environment: Evidence that the cat has a safe and secure resting space, ample resources located and managed appropriately, and the opportunity to interact on its own terms with the environment, including with people and other animals in the home. Although counterintuitive, some cats with Pandora syndrome (mostly males in my experience) exhibit more dog-like behavior, such as following their people around the house. Decisions about medical care of cats with Pandora syndrome depend on the specific presenting problem(s). If the cat is hospitalized, careful consideration of the quality of the cage environment may help the cat cope with this confinement.15,16 Questions remain about whether to treat the specific problem(s) or wait to see whether treating the environment first resolves the problem(s) and about whether some combination of pharmacologic and MEMO intervention is most appropriate for any individual patient. Only properly designed and conducted studies in the future will be able to address these questions. Because cats tend to form attachments to places, confinement in places where they don’t feel safe can adversely affect their behavior and physiology. Fortunately, effectively enriching these spaces can mitigate their perception of threat.17 Enriched conditions permit cats to cope with their surroundings and feel safe in their space. A place to hide. Cats hide to escape threats and to keep warm. They also need something to scratch and/or perch on, which we place at the back of the cage to try to help the cat feel safer. Bedding. Cover the bottom of the cage completely because bare surfaces can be cold and uncomfortable. Bedding with the cat’s and client’s scent also may reduce the cat’s perception of threat. Because most cats prefer familiar bedding, change bedding only when soiled (rather than daily). Food and water. If feasible, feed the cat its usual food. To help the cat feel safer, place the food and water bowls at the back of the cage, as close as possible to the hiding place. Litter box. Because the litter box is used less frequently than food and water bowls, it can be can be placed at the front of the cage. Covered door. To reduce potentially threatening stimulation, cover as much of the cage door as possible. 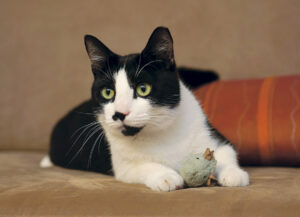 More detailed information about caring for hospitalized cats is available at indoorpet.osu.edu. Because most cats prefer familiar bedding, change bedding only when soiled (rather than daily). FIGURE 2. Minimal restraint of stressed cat. Lights. If natural light is not available, either use a timer to provide predictable lighting from day to day or turn lights on and off manually at the same time each day. Do not turn lights on and off each time someone goes in and out of the ward. Noise. Keep noise levels in the ward to a minimum, ideally <60 dB (which is quiet conversational level and can be measured with smartphone apps). Odors. Minimize smells such as those from dogs, other cats, perfumes, alcohol (from hand rubs), cigarettes, and cleaning chemicals (including laundry detergent). All can be aversive and stressful, especially to cats confined in a cage where they can’t move away from the odors. Temperature. Cats prefer warm temperatures, 85˚to 100˚F.18 Provide bedding that allows cats to “cocoon” to retain warmth if they choose to do so. Daily routine. To increase predictability, perform cleaning, feeding, and treatment procedures as close as possible to the same time each day, preferably by the same person. Return cage furnishings to the same place after spot cleaning, and house each cat in the same cage throughout its stay. Attention. Whenever possible, dedicate a familiar person to pay extra attention to the cat, in the form of brushing or playing. Low-stress handling. Use low-stress techniques to minimize activation of the cat’s CSRS (FIGURE 2). 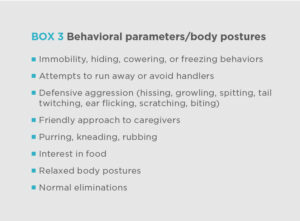 You can determine that a cat feels threatened by observing changes in its physiology (BOX 2) and behavior (BOX 3), recognizing that the changes in one cat might differ from those of another cat that feels similarly threatened. Any housing situation or handling technique can be evaluated by assessing physiologic and behavioral parameters associated with perception of threat before and after applying MEMO, which usually becomes more effective after repeated uses. Clients bring cats with Pandora syndrome to us to diagnose the cause of whatever signs concern them most. 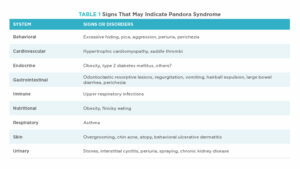 A diagnosis of Pandora syndrome means that we have identified an anxiopathy and, to the extent possible, have excluded other causes of the signs. In my experience, the most important consideration for a successful outcome for cats with Pandora syndrome is effective and empathic communication with the client.14 When a complete evaluation of the cat leads to the conclusion that Pandora syndrome is likely (pending observation of responsiveness to MEMO), we explain to the client that although no cure is currently available, appropriate therapeutic and MEMO procedures can help. We tell clients that these procedures generally keep the cat’s clinical signs to a minimum, increase its disease-free interval, and can usually be provided in collaboration with a trained technician. We also demonstrate empathy by listening carefully to the client’s (often frustrated) story of the effects of having a cat with Pandora syndrome, provide a satisfactory explanation for the sources of the signs, express care and concern for the situation, and enhance the client’s perception of control. Effective doctor-client interactions appear to enhance adherence to treatments and quality-of-life outcomes.19 We can then prescribe any appropriate therapies and, when possible, introduce the client to the technician or other staff member trained to care for cats with Pandora syndrome. This person will coach the client on how to implement MEMO. The formality of this introduction demonstrates that we intend to sustain the partnership with the client through our technical support staff to gain control of the patient’s clinical signs. Diet and feeding management. Some diets are marketed for stressed cats, but their effectiveness at managing most manifestations of Pandora syndrome has yet to be evaluated, and their salutary effects, if any, seem modest.20,21 Moreover, studies have shown that for many cats, Pandora syndrome can be effectively managed without any diet change.1,3,22 For most cases, I recommend that clients choose whichever diets (Association of American Feed Control Officials [AAFCO]-labeled) fit their personal preferences and then offer the cat a few samples of these at mealtime so the cat can express its preferences. I recommend this approach to minimize the effects of perception of diet on the activation of the CSRS of both the client and the cat. A detailed discussion of the pros and cons of diet therapy for all manifestations of Pandora syndrome is beyond the scope of this article. If a diet change seems appropriate, to reduce the risk of inducing a learned aversion to the new food, I recommend implementing it only after the cat has returned home and is feeling better. Pharmacotherapy. Choices for drug therapy, if any, depend on the individual cat’s manifestation(s) of Pandora syndrome. A variety of drugs have been recommended for use in cats with “feline idiopathic cystitis.”23 However, to my knowledge, no studies comparing their effectiveness with that of MEMO have been published. There also are hazards associated with drug therapy for cats, which include the aversion of many cats to chronic administration of oral medications and potential adverse effects. With regard to drugs that target anxiety in general, a recent review of behavioral psychopharmacology in cats reminds us that “There are no approved behavioral drugs for cats. Using any of the previously mentioned medications for purposes other than the indications listed on the label and the use of any psychoactive medication not listed previously is considered extralabel use and falls under the rules of the Animal Medicinal Drug Use Clarification Act of 1994 and its implementing regulations.”24 The review goes on to speculate that maropitant citrate (cerenia.com; zoetis.com) “has the potential for many additional uses including as an adjunct medication for the treatment of pain and as a mediator of the stress response during handling and hospitalization.” Unfortunately, there is no published evidence to support this speculation with regard to cats, and studies in other species suggest that effectiveness in the situations described is highly unlikely.25 One (manufacturer-funded) 4-week study26 evaluated use of alpha-casozepine in anxious cats, but the statistics reported leave one skeptical of the results. To my knowledge, no randomized controlled trials of use of alpha-casozepine in cats with Pandora syndrome have been conducted. In fact, the role of anxiolytic drugs in the treatment of many manifestations of Pandora syndrome remains an open question. Effective MEMO creates conditions that permit the patient to feel safe and to have unrestricted access to species-appropriate novelty, activity, and interactions with other animals (including humans). If cats with Pandora syndrome have a sensitized CSRS, then the treatments most likely to be effective are those that reduce cats’ perception of threat and increase their perception of control. Environmental conditions are known to affect the behavior and health of animals,27 particularly captive animals.28,29 Effective MEMO creates conditions that permit the patient to feel safe and to have unrestricted access to species-appropriate novelty, activity, and interactions with other animals (including humans). Effective MEMO for cats means provision of all necessary resources, refinement of interactions with the clients, an intensity of conflict that is tolerable, and thoughtful institution of change(s) to the cat’s environment (its territory). It extends the “1+1” rule traditionally applied to litter boxes (1 for each cat in the home, plus 1 more) to all pertinent resources (particularly resting areas, food bowls, water bowls, and litter boxes). Space. Each cat needs a safe refuge: a cozy bed in a desirable (to the cat) location in the home and outfitted for the cat’s comfort. A good refuge is a cat carrier, with the added benefit that habituating the cat to the carrier also facilitates crating the cat for medical care and other travel. Cats also interact with the physical structures in their environment; they need opportunities to scratch (both horizontal and vertical surfaces), climb, hide, and rest, preferably in multiple locations in the home. A study reported that for some cats, enrichment can be enjoyed in the form of scents (e.g., catnip, silver vine, Tatarian honeysuckle, and valerian [a constituent of Feliway spray30]).31 Another study reported the following preferences indicated by domestic cats: social interaction with the owner (50% of cats), food (37%), toys (11%), and scent (2%).32 Significantly more cats preferred social interaction over toys and preferred food over scent. FIGURE 3. (A) Cat with food puzzle, unsolved. (B) Solved. Food. Cats prefer to eat individually in a safe, quiet location where they will not be startled by other animals, sudden movement, or sudden activity of an air duct or appliance.33 Some cats prefer wet foods, possibly because of the potentially more natural feel in their mouth; others prefer dry foods. When a diet change is appropriate (and agreed to by the client), offering the new food in a separate container next to the usual food, rather than removing the usual food and replacing it with the new food or mixing foods, permits cats to express their preferences. Natural cat feeding behavior also includes predatory activities such as stalking and pouncing. These behaviors may be simulated by hiding small amounts of food around the house or by putting food into food puzzles (foodpuzzlesforcats.com)34 (FIGURE 3). FIGURE 4. Content cat with toy mouse. Play. Cats may enjoy play interactions with their people and can be easily trained to perform certain behaviors (i.e., tricks).38 Clients just need to understand that although cats readily respond to positive reinforcement (food), they do not respond to punishment like more group-social species because this form of social interaction never entered their behavioral repertoire. Cats also seem to be more amenable to learning if the behavior is shaped before feeding. These cats seem to like novelty, so providing a variety of toys, rotated or replaced regularly, can sustain their interest. Identifying a cat’s prey preferences enables clients to provide toys that the cat will be most likely to play with (FIGURE 4). For example, some cats prefer to chase birds, whereas others prefer to chase mice, lizards, or bugs. In contrast to play, some cats seem to prefer to be petted and groomed. Conflict. Like most of us, when a cat feels threatened, it often responds by attempting to restore its perception of control. During such responses, some cats become aggressive, some become withdrawn, and some become ill. Intercat conflict may occur when multiple cats are housed indoors together and health problems are present.35 Conflict among cats can develop because of perceived threats to their status in the home, access to valued (or scarce) resources (e.g., food, resting areas, litter boxes, human attention), other animals in the home, or outside cats. Providing a “house of plenty” may minimize these risks. More information about addressing conflict is available at indoorpet.osu.edu. All the information that clients need can sometimes overwhelm them. Try using a household evaluation checklist (indoorpet.osu.edu) to focus conversation on changes that the client perceives to be most important and is most willing to make. I try to follow up with clients in a couple of days to see what questions have come to their mind and what they have managed to do. I always ask, “How is your cat doing?” and “How are you doing?” I then contact them again in 1 to 2 weeks to learn how things are going and to provide support. If implementation of the changes has been successful, we move on to additional changes. In my experience, a time usually comes (and often quite quickly) when the client “gets it” and can continue on without additional coaching. The most effective approach to development of Pandora syndrome is prevention. Vulnerability to Pandora syndrome can develop after significant adverse experiences, particularly early in life.13 This vulnerability may be unmasked by chronic perception of threat later in life and can be mitigated by effective MEMO.1,39 The husbandry implications of this information are clear: to the extent that we can convince ourselves and our clients of the value of effective environmental enrichment for all cats, and then find and implement ways to provide it, we all—cats, clients, and veterinary staff—are likely to enjoy better health and well-being and may minimize the risk for Pandora syndrome. Many confined cats seem to cope with less-than-optimal environments. However, underlying differences in neuro-endocrine-immune responses identified in some cats with Pandora syndrome may limit their adaptive capacity; these cats may represent a separate population with increased vulnerability to provocative environments. Moreover, as veterinarians we should be concerned with providing cats with an optimal environment, not just providing the minimal requirements for their survival. Environmental enrichment is crucial for the health and welfare of all cats under our control. As their caregivers, it is our responsibility to provide enriched environments so that all cats can thrive in our care. Buffington CAT, Westropp JL, Chew DJ, Bolus RR. Clinical evaluation of multimodal environmental modification in the management of cats with lower urinary tract signs. J Feline Med Surg 2006;8:261-268. Buffington CA. Idiopathic cystitis in domestic cats–beyond the lower urinary tract. J Vet Intern Med 2011;25:784-796. Stella JL, Lord LK, Buffington CA. Sickness behaviors in response to unusual external events in healthy cats and cats with feline interstitial cystitis. JAVMA 2011;238:67-73. Buffington CA, Rogers QR, Morris JG, Cook NE. Feline struvite urolithiasis: magnesium effect depends on urinary pH. Feline Pract 1985;15:29-33. Osbaldiston GW, Taussig RA. Clinical report on 46 cases of feline urological syndrome. Vet Med/Small Anim Clin 1970;65:461-468. Osborne CA, Johnston GR, Polzin DJ, et al. Redefinition of the feline urologic syndrome: feline lower urinary tract disease with heterogeneous causes. Vet Clin North Am Small Anim Pract 1984;14:409-438. Buffington CA, Cook NE, Rogers QR, Morris JG. The role of diet in feline struvite urolithiasis syndrome. In: Burger IH, Rivers JPW, eds. Nutrition of the Dog and Cat Waltham Symposium Number 7. Cambridge, MA: Cambridge University Press; 1989:357-380. Buffington CA, Chew D, DiBartola S. Lower urinary tract disease in cats–is diet still a cause? JAVMA 1994;205:1524-1527. Schur EA, Afari N, Furberg H, et al. Feeling bad in more ways than one: comorbidity patterns of medically unexplained and psychiatric conditions. J Gen Intern Med 2007;22:818-821. Fink P, Schroder A. One single diagnosis, bodily distress syndrome, succeeded to capture 10 diagnostic categories of functional somatic syndromes and somatoform disorders. J Psychosom Res 2010;68:415-426. Yunus MB. Editorial review: an update on central sensitivity syndromes and the issues of nosology and psychobiology. Curr Rheumatol Rev 2015;11:70-85. Neblett R, Cohen H, Choi Y, et al. The Central Sensitization Inventory (CSI): establishing clinically significant values for identifying central sensitivity syndromes in an outpatient chronic pain sample. J Pain 2013;14:438-445. Buffington CA. Developmental influences on medically unexplained symptoms. Psychother Psychosom 2009;78:139-144. Herron ME, Buffington CA. Environmental enrichment for indoor cats: implementing enrichment. Compend Contin Educ Vet 2012;34:E1-E5. Carney HC, Little S, Brownlee-Tomasso D, et al. AAFP and ISFM feline-friendly nursing care guidelines. J Feline Med Surg 2012;14:337-349. Stella J, Croney C, Buffington T. Environmental factors that affect the behavior and welfare of domestic cats (Felis silvestris catus) housed in cages. Appl Anim Behav Sci 2014;160:94-105. Stella J, Croney C, Buffington T. Effects of stressors on the behavior and physiology of domestic cats. Appl Anim Behav Sci 2013;143:157-163. National Research Council. Thermoregulation in cats. In: Nutrient Requirements of Dogs and Cats. Washington, DC. : National Academies Press ;2006:270-271. Frankel RM. Pets, vets, and frets: what relationship-centered care research has to offer veterinary medicine. J Vet Educ 2006;33:20-27. Kruger JM, Lulich JP, MacLeay J, et al. Comparison of foods with differing nutritional profiles for long-term management of acute nonobstructive idiopathic cystitis in cats. JAVMA 2015;247:508-517. Landsberg G, Milgram B, Mougeot I, et al. Therapeutic effects of an alpha-casozepine and L-tryptophan supplemented diet on fear and anxiety in the cat. J Feline Med Surg 2017;19:594-602. Seawright A. A case of recurrent feline idiopathic cystitis: the control of clinical signs with behavior therapy. J Vet Behav 2008;3:32-38. Carney HC, Sadek TP, Curtis TM, et al. 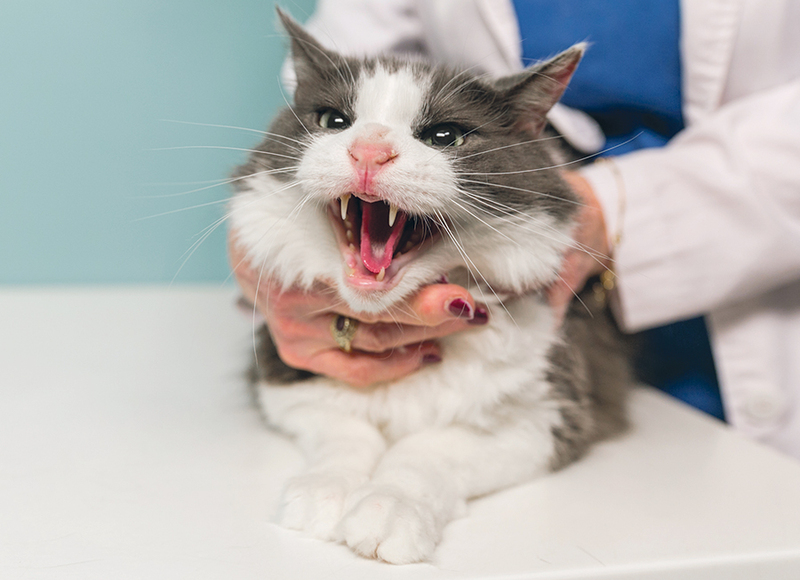 AAFP and ISFM guidelines for diagnosing and solving house-soiling behavior in cats. J Feline Med Surg 2014;16:579-98. Sinn L. Advances in behavioral psychopharmacology. Vet Clin North Am Small Anim Pract. 2018;48:457-471. Borsook D, Upadhyay J, Klimas M, et al. Decision-making using fMRI in clinical drug development: revisiting NK-1 receptor antagonists for pain. Drug Discov Today 2012;17:964-973. Beata C, Beaumont-Graff E, Coll V, et al. Effect of alpha-casozepine (Zylkene) on anxiety in cats. J Vet Behav 2007;2:40-46. Hannan AJ. Review: environmental enrichment and brain repair: harnessing the therapeutic effects of cognitive stimulation and physical activity to enhance experience-dependent plasticity. Neuropathol Appl Neurobiol 2014;40:13-25. Hoy JM, Murray PJ, Tribe A. Thirty years later: enrichment practices for captive mammals. Zoo Bio. 2010;29:303-316. Morgan KN, Tromborg CT. Sources of stress in captivity. Appl Anim Behav Sci 2007;102:262-302. 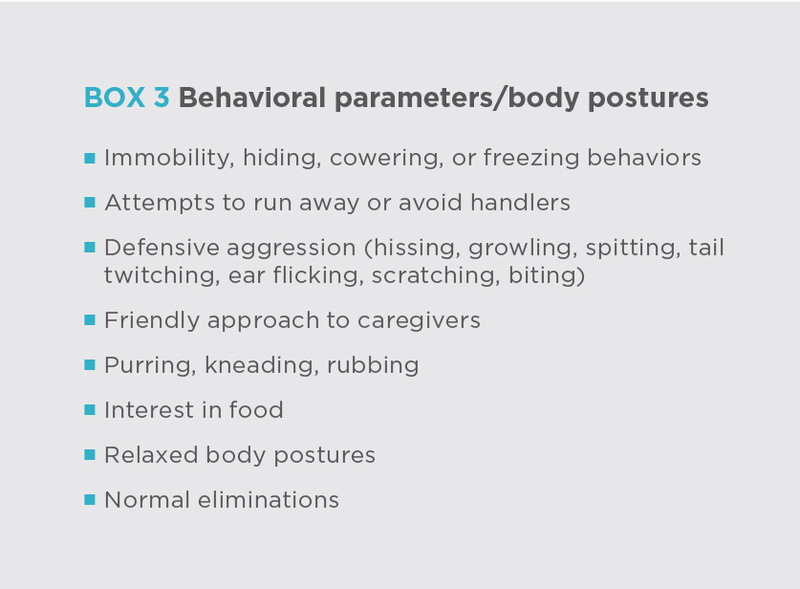 Pageat P. Properties of cats’ facial pheromones. patents.google.com/patent/US5709863A/en. Accessed June 2018. Bol S, Caspers J, Buckingham L, et al. Behavioral responsiveness of cats (Felidae) to silver vine (Actinidia polygama), Tatarian honeysuckle (Lonicera tatarica), valerian (Valeriana officinalis) and catnip (Nepeta cataria). BMC Vet Res 2017;13:1-15. Shreve KRV, Mehrkam LR, Udell MA. Social interaction, food, scent or toys? A formal assessment of domestic pet and shelter cat (Felis silvestris catus) preferences. Behav Process 2017;141:322-328. Masserman JH. Experimental neuroses. Sci Am 1950;182:38-43. Dantas LM, Delgado MM, Johnson I, Buffington CT. Food puzzles for cats: feeding for physical and emotional wellbeing. J Feline Med Surg 2016;18:723-732. Herron ME, Buffington CAT. Environmental enrichment for indoor cats. ncbinlmnihgov/pmc/articles/PMC3922041/ Accessed Jun 2018. Ellis SL, Rodan I, Carney HC, et al. AAFP and ISFM feline environmental needs guidelines. J Feline Med Surg 2013;15:219-230.
de Souza Dantas LM. Vertical or horizontal? Diagnosing and treating cats who urinate outside the box. Vet Clin North Am Small Anim Pract 2018;48:403-417. Bradshaw J, Ellis S. The Trainable Cat: A Practical Guide to Making Life Happier for You and Your Cat. New York: Basic Books; 2016. Sale A, Berardi N, Maffei L. Environment and brain plasticity: towards an endogenous pharmacotherapy. Physiol Rev 2014;94:189-234. Buffington CAT, Westropp JL, Chew DJ. From FUS to Pandora syndrome; where are we, how did we get here, and where to now? J Feline Med Surg 2014;16:385-394. Rochlitz I. Recommendations for the housing of cats in the home, in catteries and animal shelters, in laboratories and in veterinary surgeries. J Feline Med Surg 1999;1:181-191. Buffington CAT. External and internal influences on disease risk in cats. JAVMA 2002;220:994-1002. 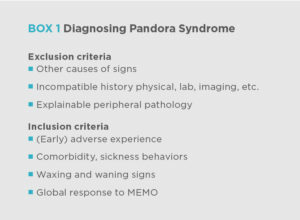 Pandora syndrome describes an “anxiopathy,” a pathologic condition resulting from anxiety associated with chronic perception of threat. This article suggests provisional criteria for the diagnosis and makes general recommendations for MEMO1 to increase the patient’s perception of control and reduce its perception of threat. a. Clients may be frustrated with their cat. b. There is a lot of information to be conveyed. c. The client needs to do most of the work.